Recently I did eid lunch at my place. Alhamdulillah we all had a great time. Some of the sisters asked me how I made the cheesecake. 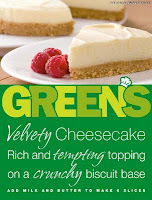 As I mentioned earlier, I get the Greens cheesecake mix (pictured left) and add whatever I like . If you like white chocolate you can grate or make curls with a vegetable peeler. Otherwise you can make some rich chocolate sauce and add it with the creamy mixture at the top. If you like fruits then you can add some strawberries or raspberries . It's very easy and anyone can make it.You can get the mix from any supermarket Insha-Allah. So enjoy !